What is Formula-based Product Lifecycle Management (PLM)? Formula-based product lifecycle management (PLM) software pertains to manufacturers in process industries such as food and beverage, flavor and fragrances, personal care, specialty chemicals and pharmaceutical companies. PLM is a critical part of enterprise operations for product development. Organizations must meticulously plan the entire lifecycle of any product and maintain clear visibility into the item being created or modified throughout this process. To this end, PLM software is a key competitive differentiator for businesses. Knowing which system to invest in, and what, exactly, to look for, in your PLM solution is a critical component to the product development lifecycle. Don’t know what to do with all that product data? New product development or modifications and changes to existing products creates a massive amount of data. From ideation and design to formulation, manufacturing and, finally, delivery, each step brings its own piece - or pieces - of information to the puzzle. Companies must have a way to organize, control, manage and track all this data to create an efficient, effective supply chain - hence the need for PLM software. 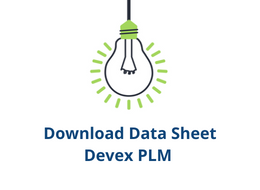 PLM software helps organizations manage product development lifecycles by creating data warehouses and automating the management of product-specific data. All of this is done in the name of improving efficiency and eliminating waste. From idea to label, Devex ensures compliance and facilitates innovation for the entirety of formula-based PLM. Devex PLM is unique in its design, creation, implementation and maintenance. Formula-based manufacturing addresses industries using recipes or chemical compositions to create a product that, at the end of the day, can or cannot be separated into its ingredients or parts. Imagine baking a soufflé: You take all of the ingredients - i.e., egg whites, cheese, butter and flour, among others - and combine them to create an entirely different product, one that can’t be broken down at the end of the lifecycle. This is why formula-based PLM tools are necessary. A design of a formula or recipe using concepts such as design of experiments (DoE) follows a creative thought process and is very different from a CAD modeling for a discrete product. Most discrete PLM solutions cannot address the specific needs of process PLM. One of the most common examples of such a specific need encompasses the analyses and assessments related to the regulatory aspects of product development The rules and data needed to govern these compliance actions for process-based manufacturing must be available throughout every stage of the product development lifecycle. Who uses formula-based PLM tools? Industries like food and beverage, pharmaceuticals, personal care and specialty chemical industries are all key examples of fields with process-based supply chains. Just ask the question: Can you break down the end product to get the same ingredients you put in to begin with? If the answer is no, then the product was most likely created using process-based manufacturing strategies. One key component to formula-based PLM is the ability to maintain compliance with strict regulatory standards. Let’s return to our example of the soufflé, because the food and beverage industry is especially important to bear in mind when considering process-based PLM and compliance with regulations. The data generated by the soufflé supply chain can help manufacturers make sure they are following those guidelines. For instance, the allergens that may come in contact with certain foods need to be documented. Whatever the case, PLM solutions help manufacturers use the available data to make sure their supply chains abide by regulatory standards. For more information about formula-based PLM and to see how these kinds of management tools can significantly boost your product development process and supply chain performance and get in touch with Selerant today. “We used a combination of systems. Devex is a very powerful piece of software that changed everything about how we manage both Formulas, and Quality information. From a day-to-day user standpoint, the biggest improvement comes from the data management and integration. Every year the amount of information that must be managed and connected grows. The linking of all these pieces in a user friendly format is what offers the efficiency we needed and advantage over other systems." 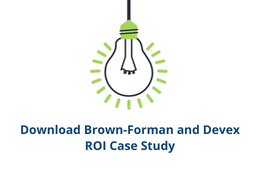 Surveyed Selerant customers estimated the ROI for using Devex to manage their New Product Development and Introduction. Of those surveyed, the majority saw an improvement of 41% or greater.